"My name is Emily Brown, and I march with the Blue Stars. I marched 2002 in the pit and 2004 in the guard. I never had touched a flag before this summer. 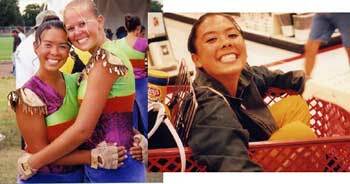 "The picture on the left is a picture of Candice and I at Finals for Division II. The picture on the right is a picture of Candice in a Target shopping cart after the Stillwater, Minn., show. "Candice became my best friend last February. We met at the February camp and clicked really fast. Everything we did this summer was together. Even though she lives in Missouri and I live in Minnesota, we still are the best of friends, and find time to talk to each other. I can't wait until camps start up again so I can see and talk to her. Because we have some catching up to do! "I just want everyone to know, you can find your best friend at drum corps, I know I did! She has been there for me through everything I went through this summer. She believed in me when I didn't believe in myself. She has been my rock and my shoulder to cry on. When my grandpa died and was put to rest the day before my birthday, she was there for me. Thank you so much Candice, can't wait to be seat partners this summer!"